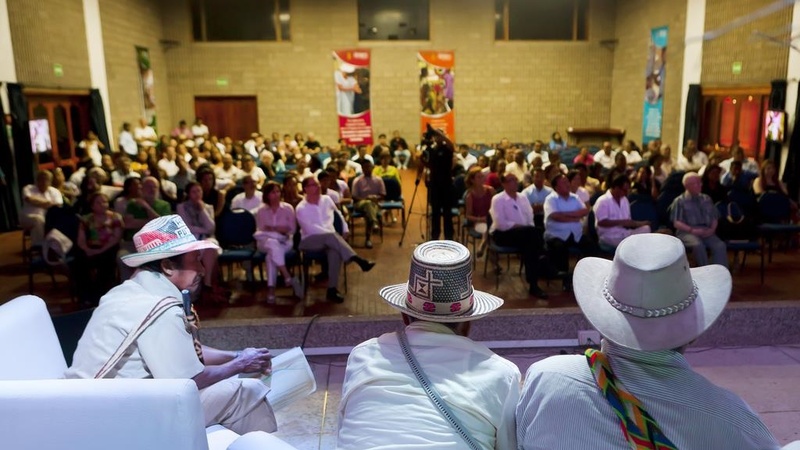 The Hay Festival has been organizing a full day’s festival in Riohacha since 2008, bringing many Colombian and international figures to the city. This year the festival took place on 24th January 2018 at the Biblioteca Monseñor Hector Salah and featured participants such as the writers Ana Alonso, Natalia Borges, Juan Cárdenas, Giuseppe Caputo, Martín Felipe Castagnet and others. Thanks to the support of PROMIGAS, Cerrejón and Banco de la República, activities were also carried out in the municipalities of Uribia, Manaure and El Molino. HFR2 11:00 – 12:00 h El Molino, La GuajiraJuan Cárdenas Juan Cárdenas (Colombia) is the author of the novels Zumbido, Los estratos (winner of the VI Premio Otras Voces Otros Ámbitos en 2014), Ornamento, Tú y yo, una novelita rusa and in 2017, El diablo de las provincias. Currently, he is a coordinator of the Master´s Degree on Creative Writing in the Instituto Caro y Cuervo, where he works as a teacher and researcher. After living in Spain between 1998 and 2014, he currently lives in Bogotá, where he works as a literary critic and art curator. HFR4 14:30 – 15:00 h Biblioteca Monseñor Hector Salah, Riohacha, La GuajiraBeatriz Helena Robledo in conversation with Edgar FerruchoThe latest book by Beatriz Helena Robledo, María Cano: La Virgen Roja, portrays the life of a woman of libertarian spirit and who was ahead of her time –the 1920s, with its climate of revolution and protest– yet who was also a leader. Robledo is a fiction and essay writer and lectures at the Universidad Javeriana. With this biography, she leaves children’s and young adult literature to show us a woman and a period full of contradictions, where the first signs of progress were accompanied by political sectarianism and violence. HFR5 16:00 – 17:00 h Biblioteca Monseñor Héctor SalahBogotá39-2017. Natalia Borges, Giuseppe Caputo, Juan Cárdenas and Martin Felipe Castagnet in conversation with Orlando Mejía SerranoFour Latin-American authors selected for the list Bogotá39 2017, which celebrates the most outstanding authors from the region, discuss about their literary work. With Natalia Borges (Brazil), Giuseppe Caputo (Colombia), Juan Cárdenas (Colombia) and Martín Felipe Castagnet (Argentina). HFR6 17:30 – 18:30 h Biblioteca Monseñor Héctor SalahIgnacio del Castillo Cottin in conversation with Sergio Dahbar When Ignacio Castillo Cottin drew up the budget for filming El Inca, he had to bear in mind that in Venezuela the prices of certain things, food for example, go up every week. However, the challenges of this film, the tragic love story of the world champion boxer Edwin Valero, did not end there since a judge banned the film in the country after a legal challenge presented by the Valero family. Apart from this, the film, nominated for an Oscar, has been a success. This film’s plot and characters breathe intensity. HFR7 19:00 – 20:00 h Biblioteca Monseñor Héctor SalahTres juglares guajirosRosendo, Tijito Carrillo and Silvio Britto will talk and sing to La Guajira. Interview with Freddy González Zubiría.